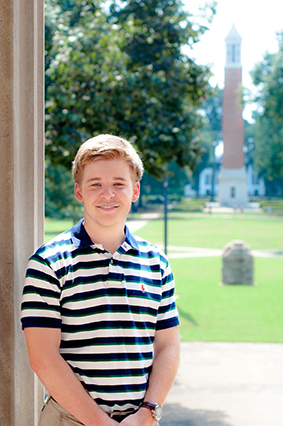 Junior Zac Adams helps run the Tuscaloosa-based, student-run nonprofit Forza while pursuing a degree in mathematics.  From the 2014 Celebrating Excellence | There’s nothing quite like being a student while also running your own business. As the chief financial officer for Forza, an entirely student-run nonprofit that gives small loans to small businesses, junior Zac Adams wears a lot of hats. He manages a team that maintains Forza’s accounting books, underwrites loans, works with lawyers, and raises the funds that make the loans possible. Tonight, like so many nights last summer, Adams will sequester himself in the Forza office in downtown Tuscaloosa, where he expects to stay past midnight churning out a packet of information he’ll use in a meeting tomorrow morning with a credit union. The credit union has expressed interest in becoming a donor, and Adams must meet with the company’s representative tomorrow. He also has two tests today. Like many incoming freshman, Adams came to UA planning to study biology and eventually go to medical school. He wanted to save the world. After taking an economics class, he realized he could help others while following his passion – math. “I enjoy finance and economics, but in the end, math is my one true love,” said Adams, who is now triple-majoring in all three subjects. Through his love of numbers and helping people, Adams found Forza. He joined the organization right after it was founded in 2009. Its goal is to give financial assistance to lower-income, small business owners that may have difficulties securing loans elsewhere. To date, Forza has given loans to seven businesses totaling $20,000. The loans have ranged from $500 to $5,000 each with interest rates ranging between 10 and 20 percent. Any extra money the organization makes goes back to other businesses through future loans. The students run the organization on their own time and without any compensation. The business has also moved from being “just a lender” to bolstering economic activity wherever it can, Adams said. For small businesses that don’t qualify for loans because they don’t have a bank account, Forza helps the business get one. For businesses that simply need the extra push to qualify for a loan, Forza offers free business coaching to improve marketing, human resources and operations management. Forza also holds seminars on campus, where professors teach small groups of businesses about accounting, rural marketing and other topics. For Adams, the best part is being able to do the two things he likes most. If finance and economics gave him the vehicles to help people, math has given him the tools. Forza is in a transition phase. Adams and the other officers are passing the torch to new leaders, and the organization is looking to expand its fundraising from local to regional and national levels. Adams said he will continue working with Forza to help train the new officers, develop a way to package loans together to sell them to banks, and start a financial literacy outreach program at local schools. This summer, he will be an intern at J. P. Morgan in New York City, where he will work with the public finance division and help raise money for city governments.